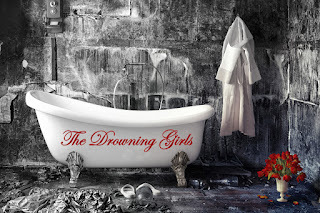 The Drowning Girls (written by Beth Graham, Daniela Vlaskalic, and Charlie Tomlinson) is about three women who were married to the same man and are all dead. From the program: "Surfacing from the bathtubs they were drowned in, the three breathless brides gather evidence against their womanizing, murderous husband by reliving the shocking events leading up to their deaths." With straightforward language and minimal sets and props, director Ben Layne tells the story of Alice (Heather Burmeister), Bessie (Megan Kim Anderson), and Margaret (Danielle Krivinchuk), all of whom meet and fall in love with George Joseph Smith, a self-styled "man of independent means" between 1910 and 1914 in England. Before they know it, and in 37-year-old spinster Margaret's case in one day, they have been wooed, engaged and married to Mr. Smith, despite their family's objections or their own misgivings. The three women tell their stories at the same time, with the other two adding commentary about their situations and emphasizing the limited choices and societal expectations that led these women to be taken in by Smith. The actors also play additional characters, from the the alternately charming and menacing Smith to doctors, friends, and family members. Each character is distinct, no matter how short the appearance. But the brides are the characters that are most fully realized, even as they themselves are coming to understand the situations that led to their decisions to marry. The inventive staging occurs in and around the three bathtubs, which the actors are frequently getting in and out of. The costumes, evocative of the era but not rigorously of the period, get a soaking along with the performers, and are a constant reminder of how these brides lost their lives. Haunting and subtle, these actors and this play tell a world of stories in only 70 short minutes. The final scenes and song will leave you with chills and sadness. Very much recommended.